So what’s the latest on that shiny new wall that Americans were ‘promised?’ Well, as yet no new sections have been built, almost two years into Donald Trump’s presidency. He has had great difficulty securing the vast sums of money needed from Congress, many of whom believe the project to be the most expensive, yet least effective way to deter illegal immigration. In typical fashion, Trump has taken it badly. Threatening to shut down the government in order to get his way, negotiations have stalled over a request for $5 billion in funding for the wall. But wait, wasn’t Mexico supposed to be happy to pay for it anyway? And what about priorities like health insurance, education and infrastructure? 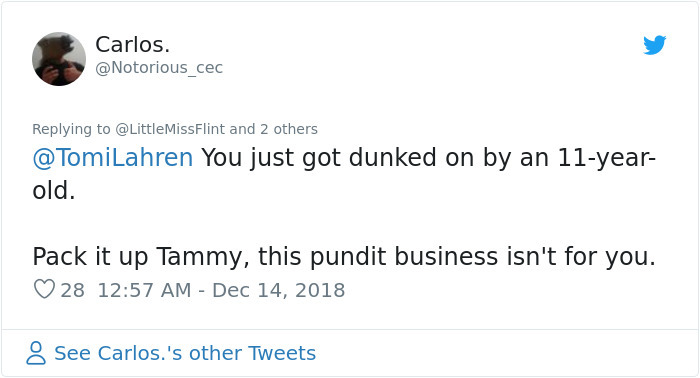 Things that affect the real lives of millions of Americans every day? Fox News contributor and sycophantic Trump cheerleader Tomi Lahren believes that a thousand-mile symbol of hysterical fear and insularity trumps all of these things. “$5 billion spent on a wall will be the BEST $5 billion taxpayers EVER spent! Build the wall. Secure the border. America FIRST!” she tweeted optimistically. 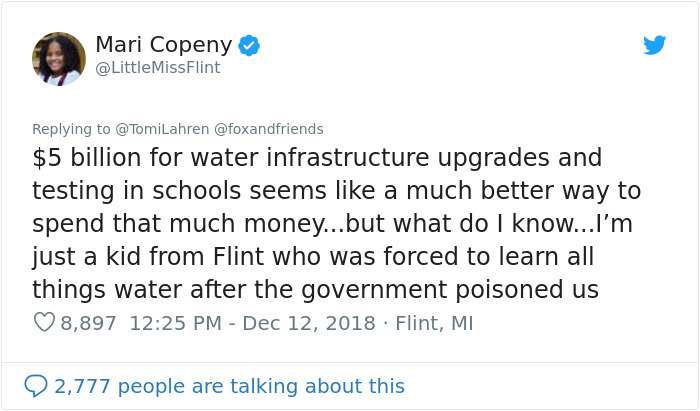 Enter ‘Little Miss Flint.’ After seeing Lahren’s tweet about the wall, Mari Copeny was understandably indignant. 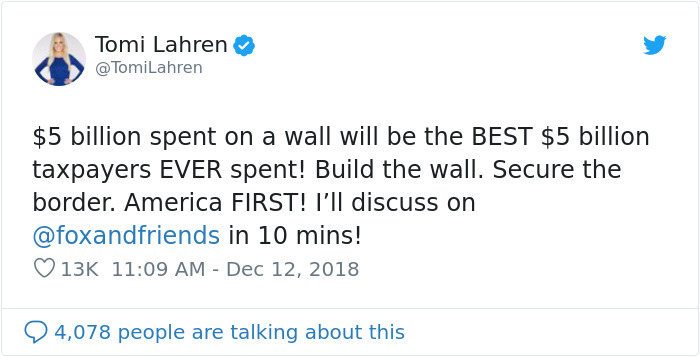 She decided to challenge Lahren’s assertion that the wall is the best use of taxpayer’s money, and proceeded to deliver a comeback that showed an eloquence and maturity well beyond her tender age. 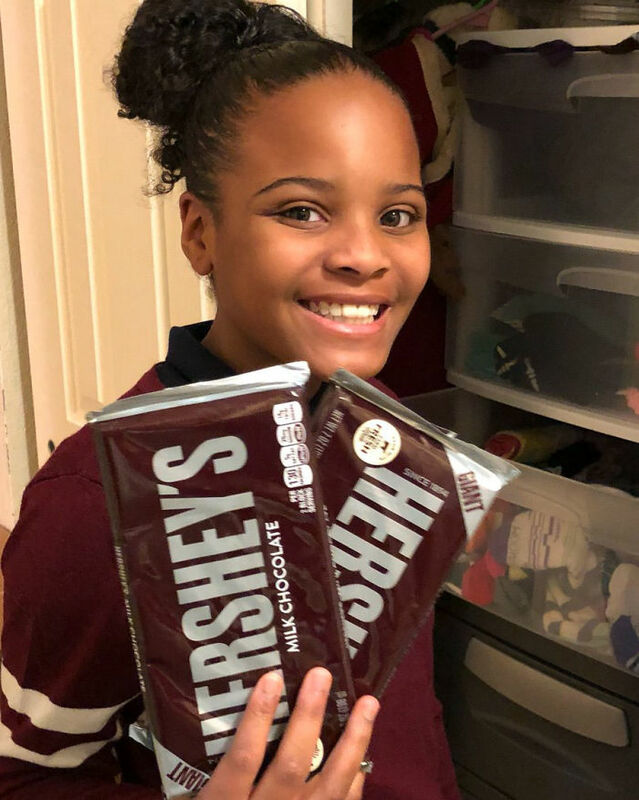 The 11-year-old from Flint, Michigan, has become well known for her bright and passionate activism, having been directly affected by the water crisis in her city. 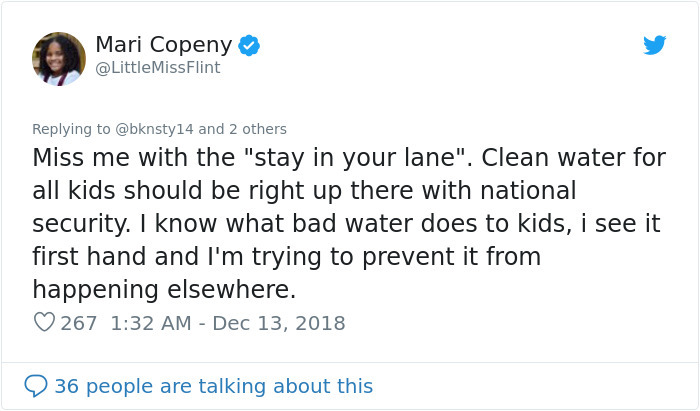 When she was just 8 years old she wrote a letter to President Obama speaking out for the children of Flint, who have been badly let down by their country. 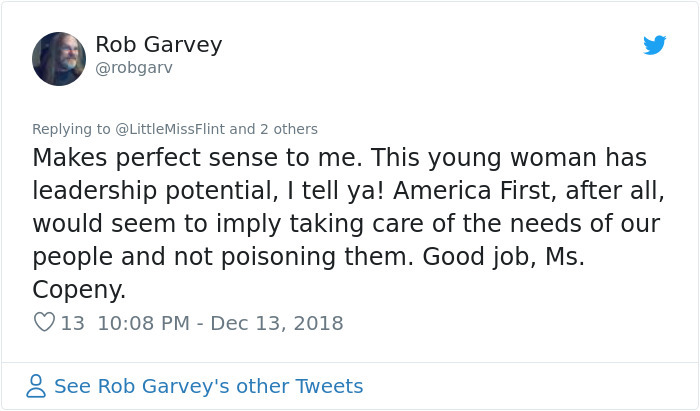 The fact that the self-proclaimed ‘greatest nation on Earth’ could allow its children to be poisoned due to the negligence of a such a basic service is a scandal, and proves that there are more urgent priorities that need to be addressed! 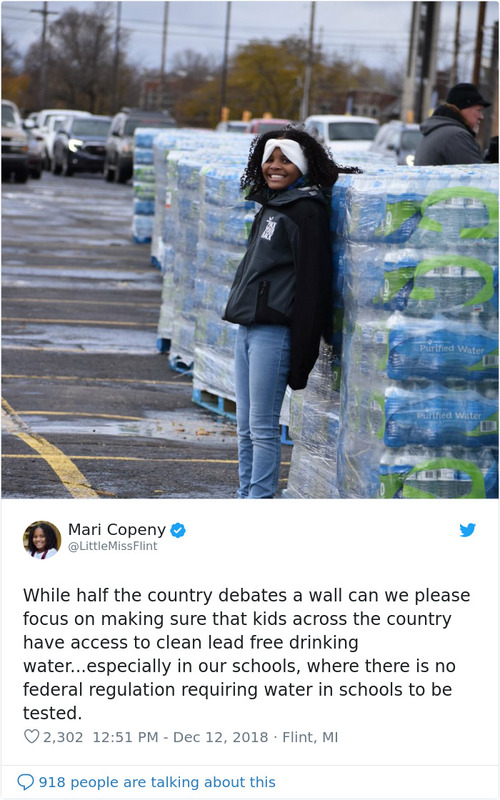 People were quick to praise Mari for her response; because any rational person knows that ensuring a clean water supply for citizens might just be a more pressing concern than Trump’s vanity project. However, as we know, there are a lot of less-than-rational people out there. 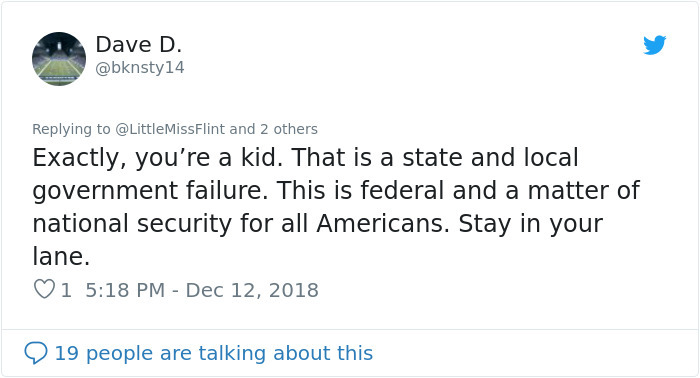 Even when challenged by a troll who told her that as a kid she should ‘stay in her lane,’ the young activist hit the mark once again, leaving people wondering who the real ‘kids’ are here. 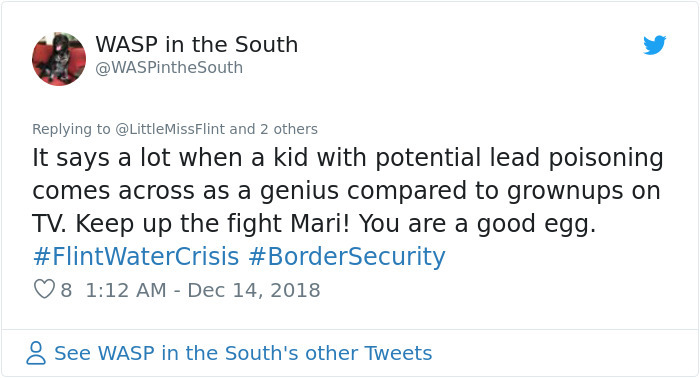 Because while Mari might only be 11 years old, she has shown herself to be far more grown-up than the people needing to build walls around themselves to feel ‘safe’ and, dare we say it, the President himself.